A revolutionary ‘learn to snowboard’ program featuring specialized terrain designed let the first time snowboarder experience success the first day on snow. 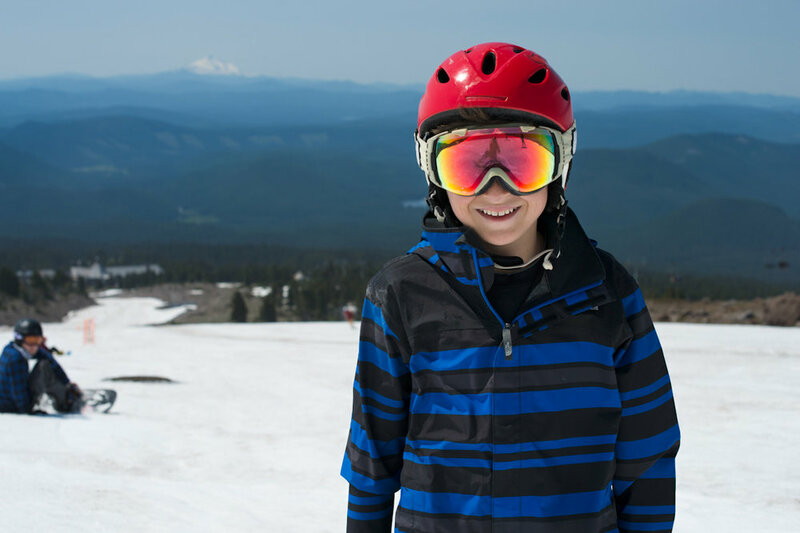 With this program you are 100% part of normal camp, but when it comes time to snowboard, you will be placed in a specialized group, riding this unique terrain designed to MAKE YOU A SNOWBOARDER! 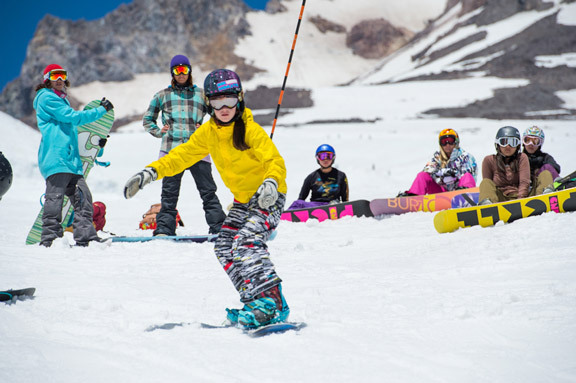 Do you or someone you know want to learn how to snowboard this summer? HCSC’s Soft Start™ program is your perfect opportunity to learn snowboarding the fast, fun and easy way. The 8-Day Soft Start™ program provides the most comprehensive learn to snowboard program on Earth. Soft Start™ is offered to both Youth and Adult campus Sessions 1-3. The goal of the Soft Start™ program is to help people become snowboarders as fast, fun, and as painless as possible. 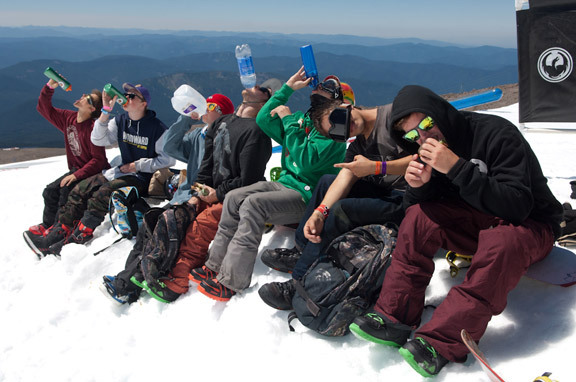 Eat, breathe and sleep snowboarding this summer. Immerse yourself the Soft Start™ & High Cascade way… ANYONE CAN DO IT! Warm weather –No need to freeze! Plus, when you’re warm, your muscles are more cooperative. Soft Snow –Nature’s crash pad…face it, you’re gonna fall, why not do it on soft snow? Learn to Ride equipment -Easy to ride boards, boots, and bindings designed specifically for beginners. Terrain Based Learning -Simple banks and rollers designed to safely get you turning your snowboard. Fun & Professional HCSC / AASI trained coaches -Some of the best in the biz. Small Group Size –5 riders or less per coach. Perfect Summer Learning Terrain -Accessed by two high speed quad chairs. Off-snow learning opportunities -Video analysis, trampolines, foam pit and skateboarding. HAVE FUN in summer camp environment! Should you be in the Soft Start™ Program? Soft Start™ is for someone who has never snowboarded or who has tried once but didn’t learn how to link turns. This program will give you success on day one. Maybe you’ve never even stepped foot on snow? Perhaps you’ve tried once or twice but you never got the hang of it? Maybe you ski and have always wanted to try or become a snowboarder? Perhaps you’ve been turned off by the blistery cold and hard icy winter slopes? No matter what your situation is, our coaches will have you snowboarding with a smile in no time. ARE YOU A BEGINNER LINKING TURNS AND READY TO ADVANCE YOUR SKILLS FURTHER? If you already know how to link turns, you’ll find that the Soft Start™ program will not progress your skills as efficiently as being in a ‘regular’ coaching group. If you’ve been snowboarding more than a few times, you’re likely ready to be placed into a ‘regular’ coaching group that goes into the park almost immediately. Each session we have approximately thirty coaching groups with 6-8 riders in each group. The coaching groups are broken out by ability, so even if you feel you’re kind of like a beginner you’ll be placed in a coaching group with other riders that are at your similar ability level. Upon registration you’ll fill out your ability form, and we’ll take care of the rest! STILL NOT SURE IF YOU SHOULD REGISTER FOR SOFT START™ OR NOT? Call or email us; we can guide you in the right direction! HOW DO I GET INTO SOFT START™? Register for any Session and choose the Soft Start™ option (if you don’t see it when you register; that means it’s full).